Litter is the most visible sign of pollution. It is anything that is left where it is not meant to be. Litter is more than just an eyesore, it contaminates drinking water, disrupts recreation, ruins habitat, and threatens the lives of all people, wildlife, and communities who depend on clean water. How does litter impact our environment? The issue of litter in our rivers is important. Litter can kill aquatic life and decrease oxygen levels when it decays in water. The top five items typically found in rivers are cigarette butts, plastic bottles and caps, food packaging, plastic bags, and aluminum cans as well as the hard to see but increasingly-present microplastics which come from larger plastic items when they break down. The tiniest pieces of trash are often being eaten by wildlife, disrupting their digestive systems. How bad is the litter problem in the Chicago River System? The Chicago River is cleaner than it has been in generations. Despite that fact, there is still an inordinate amount of garbage in the river. The Metropolitan Water Reclamation District and City of Chicago have skimmer boats that pick up 180 cubic yards of debris each year, but it's not enough. With rainfall, the amount of litter flushed into the river increases as part of the overflow in the sewer system. 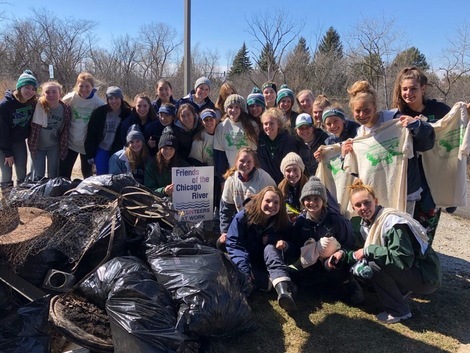 Friends, with the generous support of the Mars Wrigley Foundation, is tackling litter one stretch of river at a time and started a pilot campaign called Litter Free North Shore Channel. It has since then expanded by adding a seven-mile stretch of the North Branch. The project expansion resulted in a name change to Litter Free Chicago River. Check out the press release. There are many ways to get involved with us this season. Attend a workshop at the LL Bean Skokie store on how to run your own litter workdays, April 20. Join us May 11 for Chicago River Day, our largest volunteer clean up event of the year. 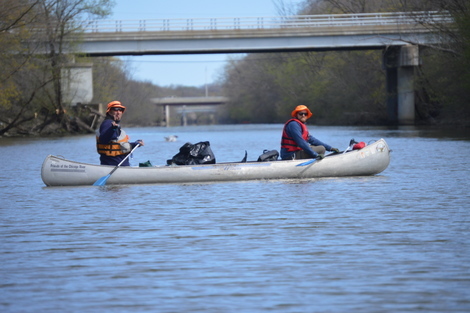 Friends hosts volunteer litter blitzes to collect trash and debris along the river. New to our volunteer programming this year, we are offering Canoes and Cleanups, a fun way to get on the river and pick up some trash with us. A list of dates and locations will be posted soon. To share what we've learned and to assist you in leading your own volunteer work days, we've developed a litter free toolkit that guides people who want to organize clean up events in their communities. It covers everything from how to attract volunteers to how to handle trash to developing press materials. It even includes a sample liability waiver for organizers to use. Download the Litter Free Chicago River Toolkit. What types of trash are you finding? Complete a trash tally of your site. Send us your data. A social media sign to post at your clean-up. Check out the events page for the next litter blitz or canoe and clean up. Document the good work you're doing with #LoseTheLitter. Friends is studying causes of litter and impact through data collection. Check out the latest on hotspotting. Canal Shores Golf Course - A 100 year public golf course is leading the way in thoughtful habitat restoration. Check out their new Master Plan and join in their monthly volunteer days. Evanston Habitat and the City of Evanston - The City of Evanston is working to restore, care and improve the natural habitat along the North Shore Channel and to enhance the channel's value as a green corridor. Northside College Prep - Coinciding with Friends' CRSN kickoff meeting with teachers, Friends' lead a litter pickup and brush cutting work morning. Northside continues to support a Litter Free NSC by hosting a site during Chicago River Day. Since starting this initiative, we've been so inspired by the many groups and individuals who have reached out to tackle litter. Check out the #LosetheLitter hashtag on social media to see Friends and partners in action, working to make the river and its river-edge communities litter-free. Do you have a group along the North Branch and North Shore Channel interested in doing a clean up? Please contact Annette Anderson at (312) 939-0490, ext. 14.